There are 23 pairs of chromosomes in human cells. An individual will receive one pair of chromosome from each parent. Down syndrome is referred to as a common chromosome disorder which results when an individual has three copies of the 21st chromosome known as Trisomy 21 instead of two. Persons with Down syndrome will suffer from mental retardation and malformations (such as heart defects), and physical deformation of the body including the face. Down syndrome is a birth defect that alters a child’s development including muscle tone and facial characteristics (slanted eyes, flat face, and low nose bridge) and creates intellectual handicaps. There is an analysis (karyotype) that is done to confirm when a child has Down syndrome; blood is taken so that the body’s cells can be analyzed. The body’s cells each contain a nucleus containing 23 pairs of chromosomes; the nucleus is storage for genetic material (genes). Nondisjunction occurs when there is an error in cell division and an embryo ends up with three copies of chromosome 21 instead of two. In conception (or prior to) the 21st chromosome in a sperm or egg may have an abnormal cell division (non-separation) and as the embryo grows the additional chromosome is copied to the rest of the body’s cells. Nondisjunction will lead to the Down syndrome type called Trisomy 21. The risk of nondisjunction in women increases with age. Mosaicism is a rare form of Down syndrome that results when nondisjunction of chromosome 21 occurs in only some of the initial cell divisions after fertilization. This means that there is a mixture of normal (46 chromosomes) and abnormal (47 chromosomes) cells. Persons with Mosaic Down syndrome may not have all the characteristics of persons imposed with Trisomy 21. 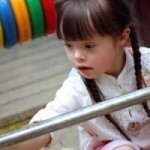 Translocation Down Syndrome cases are three times higher than Mosaic cases. Translocation occurs when a section of chromosome 21 separates during cell division and connects to another chromosome which in most cases is chromosome 14. Although the chromosome overall count will remain at 46, chromosome 21will have an added part causing the characteristics of Down syndrome. Down syndrome is mostly due to abnormal cell division during the development of the sperm, egg or embryo, there are few cases where the condition is inherited. Translocation is the only type of Down syndrome that is affected by hereditary where the disorder is passed on from one parent, with a 3% risk in fathers and a 12% risk in mothers. What Causes Treachers Collins Syndrome?